I am on record for not being a big fan of photos of waterfalls. I very often find them quite boring and there are too many ordinary waterfall photos in galleries around the world for my taste. A long exposure close-up photo of a waterfall is a winner with most customers and viewers but not for me; I have little fascination with water. I am a desert man. An interesting waterfall shot has to at least place the waterfall into context and show the surroundings. Ken Duncan and his incredible eye for composition is very good at this as demonstrated in his Mitchell Plateu shot. With no surroundings it is simply water falling; it is gravity at work! Bells Gorge is one of the many impressive Kimberley gorges cutting through the rocky and dry landscape. I’m no Ken Duncan but I have certainly placed the waterfall into context here. To the extent of the waterfall almost disappearing in this small web sized image; but at full size I quite like dramatic wide angle view in this shot. When I return I will work on improving composition though by climbing some more rocks! It is great fun and a great challenge climbing the rocks in these Kimberley gorges seeking the perfect composition. When viewing my shots later I often think ‘oh I should been standing there’. It’s the great skill challenge of composition and finding the most effective viewpoint (without falling down and killing yourself) and in the Kimberley gorges you can certainly sharpen these skills! If you study the photo you’ll see little travellers by the pool. It’s possible to climb much further; all the way down the the rocks on the left side and access a lower part of the gorge way out of this frame. You have to be a mountain goat though but I hear the results are worth it so I’ll attempt it next time! This image is a stitched panorama and I deliberately went for a dusty and hot arid look here. Bells Gorge in mid September was a nice warm spot with 40+ degrees in the sun and the special Kimberley light. I remember exactly what it was like but then again I don’t. You can’t remember this; you have to experience it. Nothing but the desert would prepare you for these fantastic conditions in the Kimberley. It is incredibly hot; the light is blindingly bright and the sun rays cuts like lasers. As impossible as it is; I want to replicate these conditions in my photo; make you feel the Kimberley and these great gorges! This is my one Kimberley waterfall shot but who knows – after my next Kimberley trip you may actually see waterfall image no. 2 from me. Start a trend! 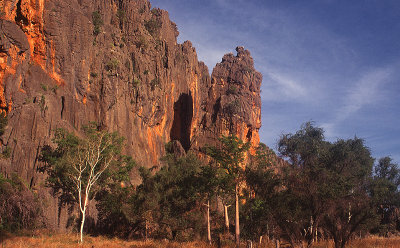 The mighty rock walls towers up to 100 meters in height on the flat spinifex covered Kimberley savannah. The gorge cuts the Napier Ranges in half for about 3.5 kilometers. The Lennard River runs through it and is home to at least 70 crocodiles. The mysterious Wandjina spirits have left their shadows on the walls in the form of rock art. The Bunuba people have lived here for hundreds of generations and still fight for their survival against the invasion of their country and destruction of their people. We are in the Bunuba home visiting Windjana Gorge National Park in Western Australia; and the above are just a few of the reasons why Windjana Gorge is my favourite gorge on the Gibb River Road! The mighty towering walls and the history of this area is magic to me. It is also a photographers paradise. You have the mighty rock walls, the crocodiles, the gum and boab trees, the caves, the art, the flat savannah, the station ruins and Tunnel Creek ensuring you won’t ever run out of compositions here! I managed a few different compositions while I was at Windjana but look forward to revisiting again. The steep ranges of the Napier Range are the walls of the gorge and even from a distance these impressive ranges will catch your eye. Below my old Fujichrome slide from my first visit in 1998 shows the walls towering straight up out of the ground! I converted this stitched panorama to duotone as I felt it gave the image more character, drama and a timeless quality compared to the original slightly flat and harsh colour version. I used Alien Skin Exposure filter and my technique documented here but for this photo I did two conversions and layer blended them. The rock walls and the sky is almost entirely the red channel which ensures a dark dramatic sky and bright rocks. The sandy foreground is mostly the blue channel as this ensures detail; the red channel had very little detail in the sand. 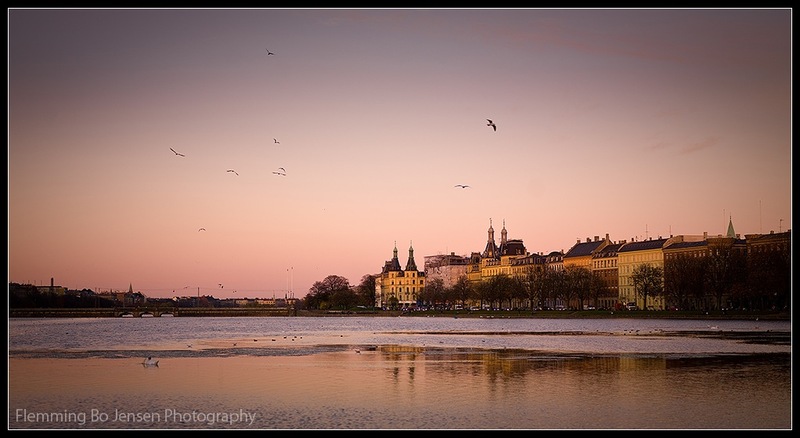 Blending different conversions is a great way to ensure details in all areas of your image. 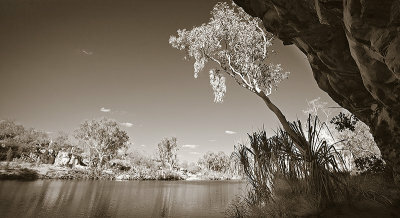 You can spend days at Windjana Gorge shooting, there is so much to work with here! 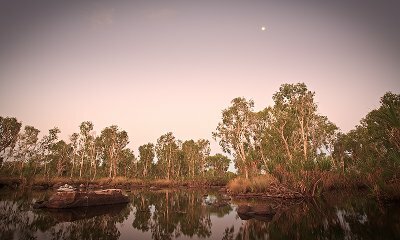 I will hopefully get a chance to teach others about this wonderful place as I will quite possibly be part of guiding a photo tour in the Kimberleys in 2009. As long as we don’t loose a few photographers to the crocs I am sure Windjana Gorge will prove to be a highlight yet again! Previously I have blogged about A Two Toned World and Return of the Toned World so I messed up the sequence a bit, but this is the 3rd of my tutorials on black and white and can now only be called: Two Toned World Strikes Back! Following in the footsteps of all the classic and contemporary black and white landscape photographers; I show you how to and create stunning black and whites from your digital images – click ‘Keep reading’ link. 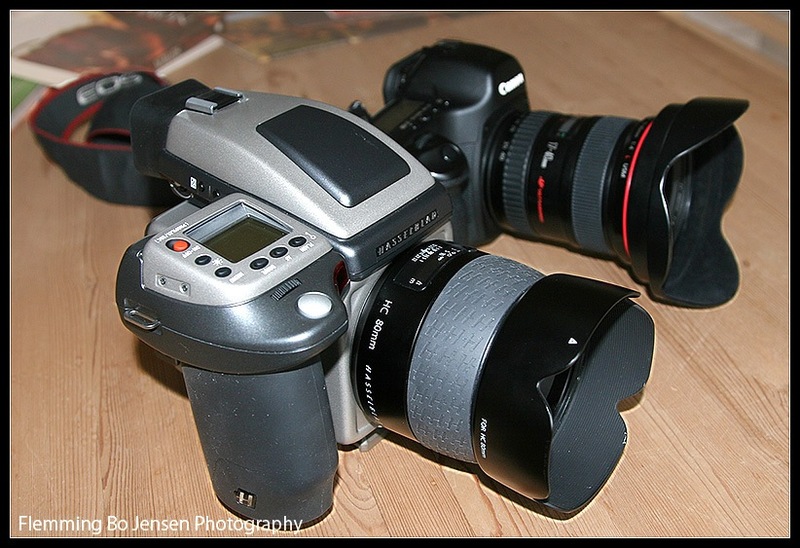 I recently had the pleasure of spending 4 days shooting with a Hasselblad H3D-39 digital SLR camera with 80mm lens – pictured on the the left alongside my Canon 5D with 17-40mm lens. Weighing in at around 2,5 kilos with the 80mm lens attached, capturing light on a 39 megapixel medium format 48x36mm digital back and costing an arm and a leg (about 20,000 Euros or 38,000 AUD) this extraordinarily looking beast of a camera makes a strong first impression! Click ‘Keep reading’ below to read all about my Hasselblad Experience. Manning Gorge is split into Upper and Lower Manning and the camp ground is at Lower Manning. To get to the Upper gorge it’s a great 3 km bush walk; but first you have to swim across the river floating your clothes, camera etc. in a foam box pushing it in front of you as you swim. Water is not all that appealing to me or my camera so I chose to explore only the Lower gorge this time! It takes a lot of practice and work getting good at shooting gorges. They’re big and beautiful but really hard to fit into a composition that shows them as big and beautiful. I always wish I could levitate (walking on water hasn’t worked for me) in the middle of the river shooting down the gorge with the gorge walls on both sides. But often you’re stuck shooting from the banks of a river or billabong and also you’re fighting the Kimberley light as one side of the gorge is bound to be in deep dark shadows and the other in extremely bright sunshine. You really have to work to find good compositions. This little spot proved to work very well and I was fortunately the only one there. If you’re at Manning then walk down to the river at sunset, turn left and keep going until you find yourself standing underneath a rock wall and almost in the water. Wait for that glorious warm and red dusk light to warm the sky and you have your shot! I am working on my Kimberley gallery at the moment so come along as I develop and upload; there are many more gorgeous Kimberley gorge shots to come! PS. There are some beautiful old and very large Boab trees at the camp ground. Beautiful old trees some bloody idiot campers have carved their names into! People carving their names into trees surely should be fed to the crocs! One of my photographic quests is to capture the perfect Outback Australia image. My perfect Outback Australia image that is. Unless you’re as obsessed with the outback as I am (is there anyone else?) I don’t know if this panorama means much but I am extremely happy with it. It is not my perfect outback image of course; but I feel it really expresses the desolate beautiful nature of the outback and has a lot of the elements I love (you see what I mean by outback clouds?). I do not like any man-made objects in my photos, but here I picked the middle of the dirt road to have a strong leading line into the image. I shot this as 8 vertical images and stitched in PTgui. Silent Grove is just the name of the camp close to Bell Gorge on the Gibb River Road; and this is basically just me having run about a kilometer down the dirt road finding an open place. The hardest part was finding a spot where I could hide the shadow of me and my tripod! Like any quest for perfection it is futile and will never end; the perfect outback image exists only in my head (although Ken Duncan sometimes comes very close with his brilliant outback work). I will just have to keep coming back to the outback and enjoy many fun and frustrating experiences chasing perfection!